Successfully Added Weatherproof Mini Bluetooth Speaker - 4000mAh Battery, , Power Bank Function, BT 3.0, 15 Hours Play Time to your Shopping Cart. This mini portable Bluetooth speaker is an affordable multifunctional device that will play your music for up to 15 hours and can even be used as a power bank should your phone or other portable electronics need a recharge. A fantastic and affordable product that's great for those long journeys. Now you can listen to up to 15 hours worth of music with Bluetooth connectivity you can easily steam music from your tablet or phone wirelessly meaning you don't have to fuss with cables or leave you phone out. 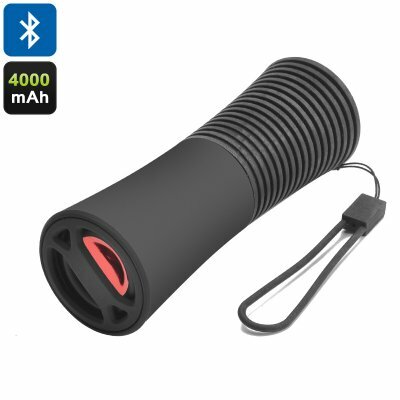 This 3 Watt speaker creates a big noise for its small size, it has a convenient wrist strap and rubberized handle that covers all the ports making it fairly weatherproof, great for accompanying you on long journeys or hikes where it can keep you entertained throughout the day no matter the weather. With a built in 4000mAh battery this mini speaker doubles as a power bank proving it to be a truly multifunctional devies. this will let you top up your phones battery or recharge other portable electronics when the mains power isn't available. This Mini Weather Proof Bluetooth Speaker comes with a 12 months warranty. brought to you by the leader in electronic devices as well as wholesale Bluetooth speakers..